Pew Research Center surveys in 63 countries have asked Muslims and Christians about belief in heaven, hell and angels. These data are included in this report as an additional way to examine gender differences in religion. 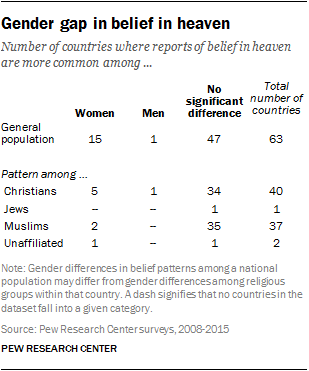 In 47 of the 63 countries (75%), men and women are about equally likely to profess a belief in heaven. Women are more likely to believe in heaven in 15 countries, often by margins of 5 percentage points or more. Men are more likely to express this belief only in Lebanon. When all 63 countries are considered together, there is only a slight average difference (2 percentage points) between the share of women who believe in heaven (91%) and the share of men who express this belief (89%). Belief in hell shows a similar pattern. Men and women in 52 of 63 countries (83%) are about equally likely to say they believe in hell. Women hold this belief more than men in 10 countries, while men surpass women in this belief in Lebanon. 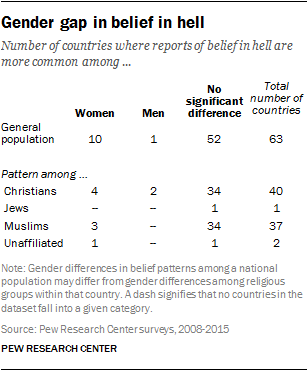 Overall, when the 63 countries are taken together, an average of 81% of women and 80% of men believe in hell. When it comes to belief in angels, men and women are about equally likely to profess belief in these celestial beings in 48 of 63 countries surveyed (76%). In 14 countries, women believe in angels to a greater degree than men do. Only in Pakistan do men believe in angels more than women. 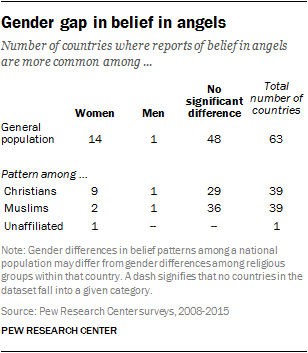 Across all 63 countries, a greater share of women than men believe in angels by an average gap of 3 percentage points. Looking at Christians only, there are just a handful of countries where the genders differ significantly in their beliefs in these concepts. A larger share of Christian men believe in heaven in only one country (Lebanon); Christian men are more likely than Christian women to believe in hell in two countries (the United States and Lebanon) and to believe in angels in one country (Zambia). On the other hand, more Christian women than Christian men profess belief in heaven in five countries (Russia, Bosnia-Herzegovina, Chile, Botswana and the United States), in hell in four countries (Kazakhstan, Russia, Bosnia-Herzegovina and Chile) and in angels in nine countries (Kazakhstan, Russia, Uruguay, Bosnia-Herzegovina, Chile, Argentina, Ecuador, Uganda and Guatemala). Muslim men and women also share similar levels of belief in these matters except in a few countries. In Pakistan, for instance, Muslim men are more likely than Muslim women to believe in angels. Muslim women are more likely than Muslim men to believe in angels in two countries (Russia and Kazakhstan), to believe in hell in three countries (Guinea-Bissau, Russia and Bosnia-Herzegovina) and to believe in heaven in two countries (Russia and Uzbekistan). Among unaffiliated populations surveyed about beliefs in two countries, the United States and Uruguay, women are more likely than men to believe in heaven in the United States (48% vs. 36%). Unaffiliated women in the United States also are more likely than unaffiliated men to believe in hell (32% vs. 28%). But, in Uruguay, equal shares of unaffiliated men and women (18%) believe in hell. Among Jews in the United States, there were no significant differences in the shares of women and men who believed in heaven or hell. Jews in the United States were not asked about belief in angels. Data on religious beliefs among Jews in Israel were not available.